Edvard Munch makes us feel the fragility of life in this mega bummer, The Sick Child. The ominous truth is that everything we know and love can be whisked away in a moment’s time. 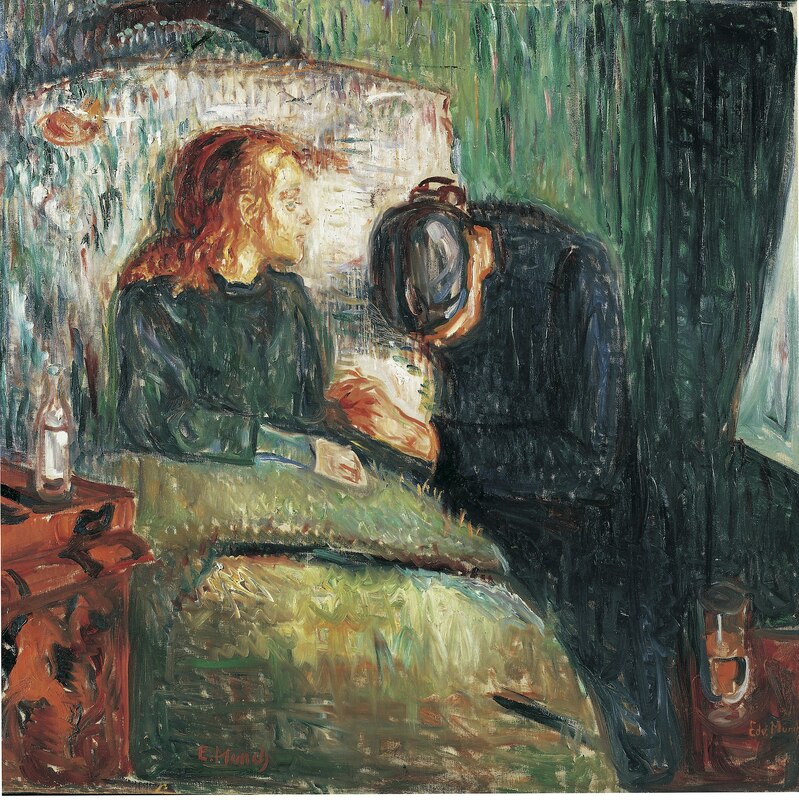 Total downer, but Munch was known to fixate on the darker side of life. Just because Munch was familiar with the cold hand of death didn't mean he was numb to the pain. Edvard was so torn up about his sister’s passing that he painted this scene of her deathbed six times. In fact, he started this series in 1885 and this painting you see in front of you was not created until 1907. Clearly the pain and sorrow stuck with Munch, but we have come to expect such a dreary outlook on life from Ed, who once said, "My whole life has been spent walking by the side of a bottomless chasm, jumping from stone to stone, and there I shall walk until the say I finally fall into the abyss." Yeesh. When this series was first shown, critics were repulsed by the subject and protested it extensively. This hatred didn't stem from a desire to see the sunny side of life, but rather the messy, expressive style of the paint itself. Today, pretty much anything can be art if you spin it that way, but back in the 1880s when this series was revealed to the public, art was still perceived as needing to be representational and exquisitely rendered. So when the art snobs of the 19th century saw Munch’s rough, abstracted painting, it was like a slap in the face. They called it "a discarded half-rubbed-out sketch." Maybe The Scream was Munch's response to the haters. Munch really couldn't catch a break. Over 40 years later the Nazi regime deemed Munch’s work to be “degenerate art” and "confiscated" many of his pieces from German museums to be auctioned off, including this one. Luckily, this painting has found itself a rightful home at the Tate. Now all of us can get in touch with our emo side and bask in the sorrows of Munch’s turbulent life.